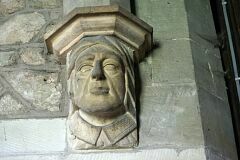 The church is mentioned in the Matriculus of 1220. It has a late C12th/early C13th tower at the unusual east end of the south aisle. 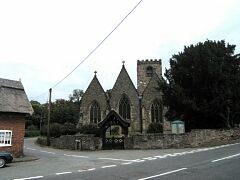 The church is over restored, the main date being 1866. 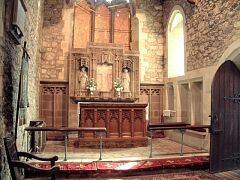 The chancel was rebuilt and shortened in 1825. Parish Church. Late C12-early C13 tower with C15-C16 upper stage. Remainder C14 in origin but much restored and partly rebuilt 1865-6. Rubble stone with slate roofs. 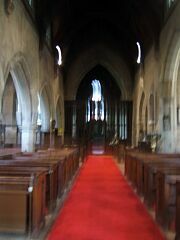 Nave and aisles, south porch, tower at east end of south aisle, chancel, south vestry. Tower is of 3 stages with slender clasping buttresses to lower stage, and battlemented parapet. 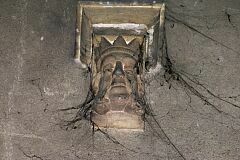 Bell-chamber openings are C15-C16 of 2 lights with cusped tracery, depressed arches and carved heads to stops and apices of hood moulds. East and west openings are transomed. Middle stage has east, west and north windows of C1200, each with 2 slightly pointed lights in an unmoulded semicircular arch. Central mullions take form of octagonal piers with small capitals. West window is blocked. South side of tower has later 2-light traceried window to lower stage. 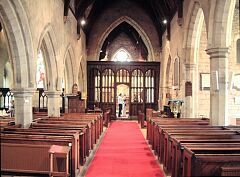 Remainder of church is in Decorated style with C19 traceried windows, off-set buttresses, and moulded plinth to nave and south aisle. 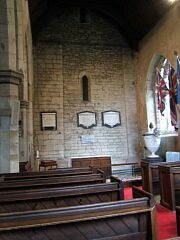 Chancel and vestry have battlemented parapets. 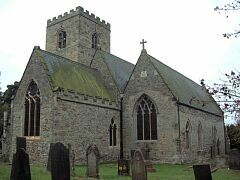 West end of church has 3 steep gables, each with 3-light window, the nave also with door in moulded arch. North aisle originally of earlier C14 date than remainder, with 3 2-light windows to north, 3-light east window, and small north door in chamfered arch. Later C14 south aisle has 2 and 3-light windows and larger south doors in completely restored moulded arch. 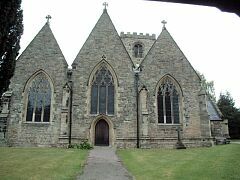 South porch is gabled, with gabled buttresses, chamfered arch on semi-octagonal piers, and small cusped side lights. 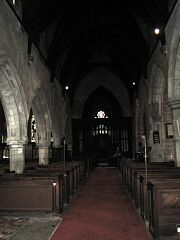 Chancel has 2-light north window, single cusped light to south, and large 3-light east window. Vestry is C19-C20 with traceried windows and south door. 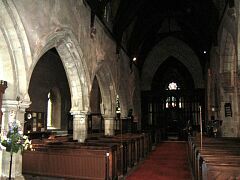 Interior: nave arcades have double chamfered arches on octagonal piers. North arcade, of 5 bays, has shorter arches and capitals of different design to those of taller 3-bay south arcade. C19 roofs, the nave with C19 clerestory of 2-light traceried dormer windows. Aisles each have a piscina that to south with cusped ogee arch. Tower has lancet windows to lower and middle stages of west wall, and heavy double-chamfered arch to nave. Similar chancel arch with piscina and sedilia. Fittings: restored circular C12 font with frieze of diagonally crosses squares, in baptistery surrounded by traceried wooden screens of 1929. More traceried wooden screens at east end of north aisle. much restored but with some C15-C16 fragments. 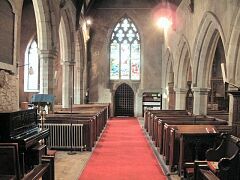 Chancel screens of similar date were brought from Colston Bassett, Notts in 1894. Good pulpit of 1613 with carved arcaded panels, brought from Shefford, Berks 1897. Chair dated 1W 1655. Late C19-C20 glass. Monuments: to Mary Dawson 1779, in form of large white marble urn with flame finial and draped inscriptions, on marble pedestal with panels commemorating children. Other marble wall tablets, including one Abigail Smith 1695. 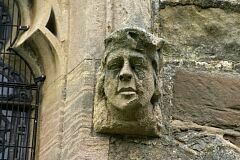 Project Gargoyle survey work in 2009 recorded late C14th corbels with human heads in the nave, possibly caricature portraits of living people. 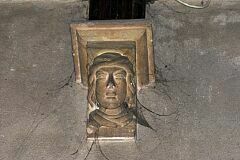 Also human heads (probable portraits) on either side of the exterior of the east window and small heads on the tower. 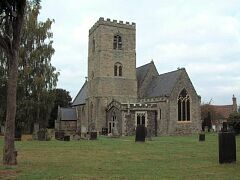 <1> Pevsner N, 1984, The Buildings of England Leicestershire and Rutland, p278-9 (Bibliographic reference). SLE4. 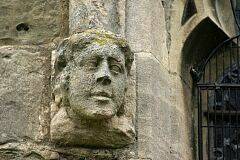 "Late C12 or early C13 tower in a curious position at the E end of the S aisle. The lancets facing into the aisle prove that it must have originally have stood free towards the west arch towards the nave on the N side. Broad but insubstantial clasping buttresses. 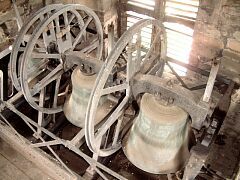 Twin bell-openings with octagonal shafts between on the N, W, and E sides only. Top stage Perpendicular. The church is over-restored. The main date is 1866. As it is now, it faces W with three exaggeratedly steep gables, certainly pre-Victorian. The tracery was all new or renewed in the C19. Odd C19 dormer arrangement for the clerestory windows. N and S arcades of octagonal piers, but differing heights. Chancel rebuilt and shortened in 1825. - FONT. Norman, circular, drum-shaped, with three bands of saltire crosses. - SCREEN. Tall and good, with four-light divisions. Brought from Colston Bassett, Nottinghamshire, 1894. - Some original Perpendicular parts in the N aisle screen. - PULPIT. 1613. Brought from Great Shefford, Berkshire, 1897. - STAINED GLASS. E window by Hardman, 1866. - Glass by Heaton, Butler & Bayne in the N aisle E (d.1914) and nave W (d.1917) windows. - MONUMENT. Mrs Mary Dawson c.1779. Free-standing urn on a black plinth (cf. 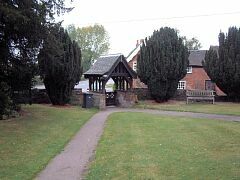 Shepshed). Signed by Hind Jun." <1> Bibliographic reference: Pevsner N. 1984. The Buildings of England Leicestershire and Rutland. p278-9.